FT04 stainless steel tactile Indicator classic has 14 concentric rings and comes with 12mm leg. It is designed to be fixed by drilling a hole and gluing the leg in to place with an epoxy adhesive. 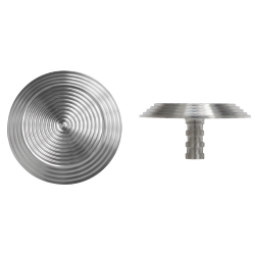 Stainless Steel Tactile Indicator is designed for the visually impair people and are applied at public, commercial, retail and industrial areas providing early warning for hazards such as ramps, stairways, escalators, travelator, public transport stations and stops.